... or if you'd simply love to learn more about them, please subscribe to The Tropical Breeze newsletter. Creating tropical garden and landscape designs. How to create the perfect tropical interior design with tropical furniture and exotic design accessories. 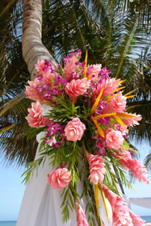 Finding the top sources for planning and creating a tropical themed dream wedding or celebration. A variety of other topics related to tropical plants and flowers. We'll be updating and growing this site with more and more tips and information related to tropical plants and flowers. Please subscribe to our monthly e-zine so you don't miss a thing.